California Gov. Gavin Newsom walks up up the center aisle of the Assembly chambers to deliver his first of the State of the State Tuesday in Sacramento, Calif. In his first State of the State speech Tuesday, California Gov. Gavin Newsom wasted no time in criticizing what he called President Trump's "fear-mongering" over the "so-called 'border emergency'" as a "manufactured crisis" and "political theater." "The answer to the White House, with all due respect: No more division, no more xenophobia and no more nativism," he said, one day after signing an order removing most California National Guard troops from the Mexican border. 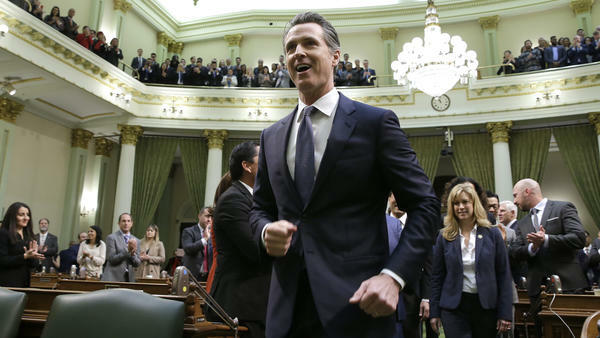 In the speech, Newsom also announced plans to scale back California's bullet train, and talked about combating the state's surge in wildfires, the bankruptcy of its largest utility in PG&E, public school funding and expanding health care coverage. In addition to immigration, the governor criticized the White House on health care as "laser-focused — has been for years — on destroying the Affordable Care Act," blaming the end of the individual mandate to purchase insurance coverage for a sharp increase in premiums on California's state-run health care exchange. But the only time the governor mentioned Trump's name was to praise him. "I want to thank President Trump for calling attention to prescription drug prices last week in his State of the Union," Newsom said, noting he's ordered his administration to begin working toward a single-purchasing system that he argues will cut costs. "This is a bipartisan issue — at least it should be — and I hope he follows through, and takes the lead of California in the process," he said. Announcing he'll scale back the state's bullet train project, a signature of his predecessors, Newsom said, "Let's be real: The current project, as planned, would cost too much and take too long." The $77 billion high-speed rail line was first approved by voters in 2008, when the projected cost was $33 billion. The project's price tag at one point hit $99 billion. Specifically, the governor proposed delaying construction of a train connecting Los Angeles and San Francisco — let alone the larger goal of Sacramento to San Diego — and instead focus on a route between the smaller Central Valley cities of Bakersfield and Merced. He acknowledged critics would ding this move as a "train to nowhere, but I think that's wrong and I think that's offensive." "Let's get something done once and for all," he said, arguing the Central Valley should not be left out of the project's "economic transformation." One of the nation's most powerful Republicans signaled an openness to Newsom's announcement. "I look forward to working w/ Governor Newsom and federal officials in the coming weeks to best mitigate what has already been wasted on high-speed rail due to the previous Administration," tweeted House Minority Leader Kevin McCarthy. "He admitted it has been a failure, but he committed to keep spending billions on the failed project" by changing it to "a Central Valley commuter train," state Sen. Jeff Stone said in a statement. "That's not what people were promised, and the project should be killed outright." Newsom's announcement seemed to confuse supporters and critics alike, prompting his administration to clarify that the Central Valley segment's prioritization does not mean the abandonment of the entire project. "Importantly, [the governor] also reaffirmed our commitment to complete the environmental work statewide, to meet our 'bookend' investments in the Bay Area and Los Angeles and to pursue additional federal and private funding for future project expansion," California High-Speed Rail Authority CEO Brian Kelly said in a statement. And in a tweet, the governor's chief of staff, Ann O'Leary, said Newsom "fully committed to high speed rail as part of All in California economic transformation, and clean energy future." In his address — which lasted nearly 45 minutes, more than twice the length of the average State of the State speech by former governors Jerry Brown and Arnold Schwarzenegger — he also signaled support for a single Delta tunnel. It's a reduction of former Gov. Brown's vision for two tunnels along the Sacramento River that would transfer water to Southern California, but one already under consideration during the waning weeks of the Brown administration. "The status quo is not an option," the governor said of the contentious project. "Our collective effort must be to cross the finish line on real agreements to save the Sacramento-San Joaquin Bay Delta." Newsom ended his address with the story of registered nurse Allyn Pierce, who braved the flames of the Camp Fire in Paradise, Calif. to help treat and evacuate patients from the town's hospital. "Taking care of each other, showing courage when it matters most — this is what we do in California," the governor said after recognizing Pierce in the Assembly gallery. "Yes, we have much left to do, but I believe in the remarkable talent assembled here, and I believe in our state. And I know this, in the bottom of my heart: The best is yet to come." Copyright 2019 Capital Public Radio. To see more, visit Capital Public Radio.